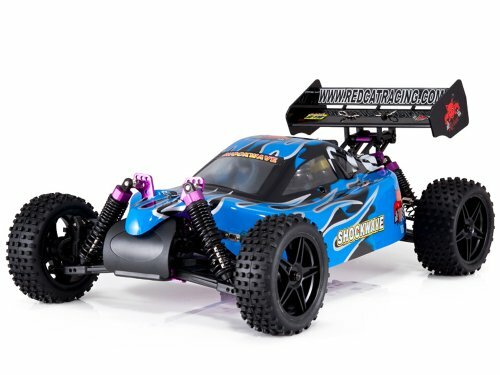 The Redcat Racing Shockwave 1/10 Scale Nitro Buggy is ready for action on and off the main road. It's built to handle all types of conditions and with a pull start Vertex VX .16 engine, single speed transmission, and 4WD, you could say it's "tough as nails and goes like a bullet". Being such a tough little buggy it's perfect as a first nitro (nitromethane) vehicle for someone who needs to get some practice driving a nitro powered beast. It's strong and fast making it perfect to race on any off road track or it can even handle whatever the "kids" (young and old) can dish out in the backyard. 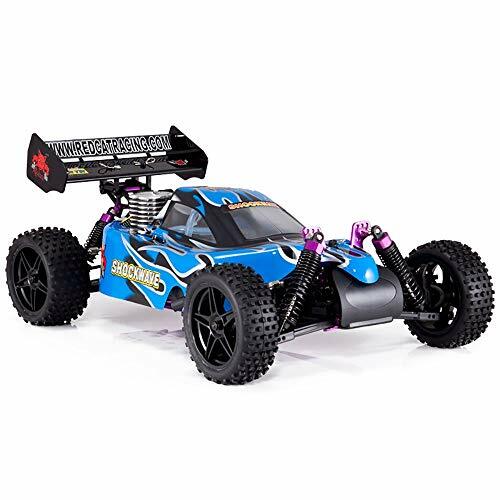 The single speed transmission makes it simple, durable and reliable with a 2.5mm 6061 annodized aluminum chassis, aluminum capped oil filled shocks, and composite disc brakes built into the standard buggy. Steering and throttle controls are simple and smooth with the 2.4GHz radio control unit (upgraded in 2013 from a 27MHz AM radio). It comes 99% ready to run with only the wing to be attached, eight AA batteries into the transmitter and four AA batteries in the receiver needing to be installed. However, it is a good idea to make sure all the nuts and bolts are tight, especially where the engine, steering and shocks are mounted. 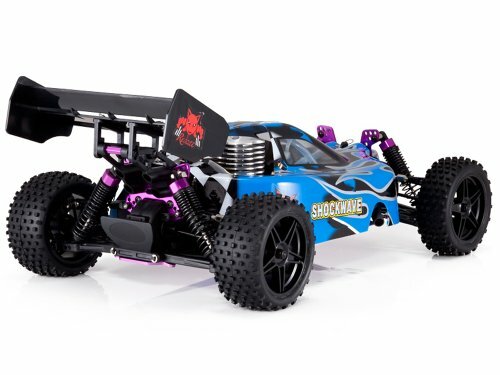 As you can see the Shockwave Nitro Buggy packs a nice punch when tuned for performance, and with a sump pickup 70cc fuel tank you have enough fuel do get a decent run time before you need to fill the tank again. The with flip-top lid and fuel spill guard on top of the tank, refueling is a snap so you can get the pit-stop times down to only a couple of minutes (if that) before you're out tearing up the dirst again. For added safety the fuel tubing is routed away from any moving parts or heat sources. The Shockwave isn't tiny either being 400mm or 16in long and has a ground clearance of 26mm, which is just over 1 inch. So be prepared for a little monster with BIG power and speed. The Shockwave Nitro comes with a standard radio control and receiver. The transmitter gives you servo reversing, trim knobs and an impressive range of operation. You should get close to fifty yards (45.5 metres) before losing control. There are also three led battery life indicators you can keep an eye on so you know when you need to change them for a new set of recharged batteries. The Shockwave is well designed with an appealing paint job and great looking flames. The body has all the necessary holes for the engine, high-speed needle and antenna pre-cut. The front and rear differentials are firmly attached to the upper plate, but it is a good idea to check the mountings before each run to make sure everything is tight. Some dirt could get through the filters into the carburetor, a little oil can help prevent this. Redcat Racing offers a Lifetime Engine Replacement Program for their nitro cars in addition to the 90 Day Limited Warranty they offer with all new vehicle purchases. If you cook the engine after the warranty period all you need to do is return the damaged engine from your Shockwave buggy and get it replaced with a new nitro engine for Half Price plus return shipping. I was very impressed with this service as I'm sure you are. Now being a Nitro Buggy you will need a couple more things if you don't already have them. You will need a Nitro Starter Kit and Nitro Fuel. Both are available separately on this site, but there is also a Bundle Deal (click here to see it) if you need everything all in one go. Look below at the related products to find each of the extra items needed if you don't already have them. Items Not Included: The electric starter kit does not include a glow starter. To use the electric starter, you must first remove the engine from the Shockwave chassis and install a backplate which is included in the starter kit. You will also have to provide AA batteries for the radio transmitter. Another good idea before you get started is to use blue Loctite for screws threading into metal and filter oil for the air filter. 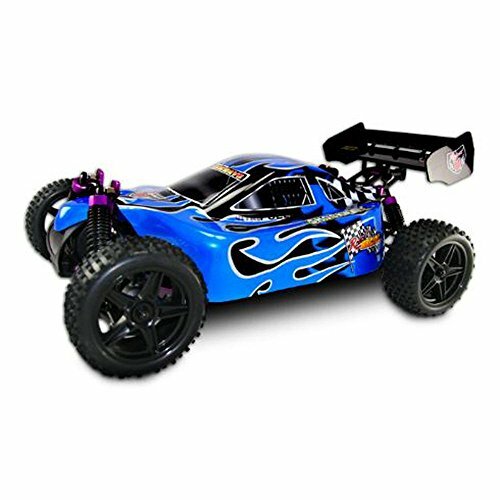 The Redcat Shockwave Nitro Buggy is a good value for money package that many are enjoying and have written glowing feedback. This product is recommended for ages 14 and up. As with other nitro powered vehicles, the engine must be properly broken in for use. Follow all manufacturer instructions for operation of the buggy and use the same fuel mix (% nitro) for running as for break in. Redcat Racing have created some nice tutorial videos for engine break in, tuning. You can watch these on our video page by clicking here, the page will open in a new tab so you won't lose your place here. They are very helpful for new nitro hobbyists and we recommend watching these while you wait for your new Shockwave buggy to arrive, especially if this is your first nitro car. Please watch all the helpful videos available on our blog while you wait for your Shockwave Nitro Buggy to arrive.